Bust of Julius Caesar, the character for whom the play is named. However, Caesar is not the central character and is killed in the middle of the play. Julius Caesar is a tragedy by William Shakespeare based on the death of Roman emperor Julius Caesar. The play is followed by Antony and Cleopatra. The play is famous for Antony's 'Friends, Romans, Countrymen' speech. The play opens with Julius Caesar's triumphant return to Rome, having defeated his enemies including his lead rival, Pompey. Shortly after his arrival, a nobleman, called Cassius, starts a plot to assassinate Caesar. Several Romans are jealous of his new power and seek to take it for themselves. One of the unsure conspirators, Marcus Brutus, does it for a different purpose; to preserve the Roman Republic. The assassination takes place as planned and the conspirators proclaim that Caesar was an ambitious tyrant. 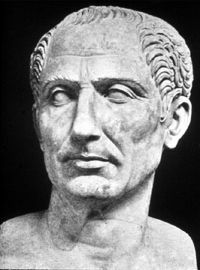 However, they make the mistake of letting Julius Caesar's close friend, Mark Antony, to give an oration at the funeral. He rallies the Romans against the conspirators and they flee. Antony and Caesar's nephew, Octavius, form an army to take the conspirators. Both of their armies meet at Philippi. The conspirators lose the battle and both Brutus and Cassius commit suicide. Julius Caesar is a hailed victor over Pompey and dictator of Rome. His assassination happens midway through the play. He appears to Brutus before the Battle of Philippi. Octavius Caesar is the nephew of Julius Caesar, who takes the title Caesar after the assassination. He fights at the Battle of Philippi. Mark Antony is a friend of Caesar, who stirs Rome in anger towards the assassins. He also fights at the Battle of Philippi. Lepidus is a weak triumvir after Julius Caesar's death. Brutus is a noble Roman, who leads the assassination of Caesar for the general good. He commits suicide after the Battle of Philippi. Cassius is an ambitious Roman, who brings Brutus into the conspiracy. He dies mistakenly believing the Battle of Philippi is already lost. Casca is the first conspirator to stab Julius Caesar. Trebonius, Legarius, Decius Brutus, Metellus Cimber & Cinna are the remaining conspirators of Caesar's assassination. Cicero is a Senator of Rome, who briefly appears at the beginning of the play. Flavius & Marullus are two tribunes who rebuke the people for cheering Caesar's victory when they also cheered Pompey. They try to tear down Caesar's monuments, but are silenced. Cappurnia is the wife of Julius Caesar. She warns him not to go to the capitol, but fails to persuade him. Portia is the wife of Brutus. She is grieved by his recent melancholy. When he flees Rome, she commits suicide. A Soothsayer that warns Caesar of the Ides of March. Julius Caesar has been occasionally treated to film. In 1953, Joseph Mankiewicz directed a black-and-white film starring James Mason as Brutus, John Gielgud as Cassius and young actor, Marlon Brando, as Antony. Gielgud's and Brando's performances have been highly praised. More recently in 1970, Stuart Burge played in one with Charlton Heston as Antony, Jason Robards as Brutus and John Gielgud as Julius Caesar. Heston had also played in an earlier 1950 version of the play as Antony. He thinks too much, such men are dangerous"
And therefore are they very dangerous." "Et tu, Brute! Then fall, Caesar!" "Friends, Romans, Countrymen, lend me your ears;"
Did what they did in envy of great Caesar;"
↑ It can be classified as a history, but is normally classified as a tragedy. This page was last modified on 12 July 2016, at 00:35.